The New Zealand region of Canterbury mostly comprises the Canterbury Plains. The region is bounded in the north by the Conway River, to the west by the Southern Alps and to the south by the Waitaki River. Christchurch is the main city and Timaru is second in size. Other townships range from Kaikoura in the North to Ashburton in the south. Akaroa is a town on Banks Peninsula in the Canterbury region of the South Island of New Zealand. It is 82 kilometres by road from Christchurch. Set on a beautiful, sheltered harbour and overlooked by craggy volcanic hills, Akaroa is a popular resort town with a decidedly French flavour. Many Hector's Dolphins may be found in the harbour, and 'swim with the dolphins' boat tours are a major tourist attraction. Amberley is a town located in the Hurunui District of north Canterbury, on the east coast of the South Island of New Zealand. It is located approximately 50 kilometers north of Christchurch. Waipara and Leithfield are nearby villages. Ashburton is a town in the Canterbury region on the east coast of the South Island of New Zealand. The third largest centre in Canterbury after Christchurch and Timaru, it is the main centre of Mid-Canterbury. Ashburton is located 80 kilometers south of Christchurch just a little over an hour's comfortable drive. The town is the centre of a rich agricultural and pastoral farming district, part of the Canterbury Plains. It has one large suburb, Tinwald, which is south of the town. Christchurch is the main city in Canterbury, New Zealand. It lies at the southern end of Pegasus Bay, in the middle of the east coast of the South Island, between Banks Peninsula and the Canterbury Plains. The official "city" is bounded, to the east by the Pacific Ocean coast and the estuary of the Avon and Heathcote rivers, to the south and south-east by the volcanic slopes of the Port Hills, and in the north by the Waimakariri River. The urban area extends a little further. The large number of public parks and many well developed residential gardens with many trees throughout the city have given it the name of The Garden City. Hagley Park and the Christchurch Botanic Gardens are located in the centre of the city, with Hagley Park being a site for sports such as golf, netball, and rugby, and for open air concerts by local bands and the Christchurch Symphony Orchestra. With much of the city being flat and only a few metres above sea level, spectacular views can be obtained from almost any high building. At these low elevations the city appears more like a forest with only a few buildings visible, rather than a major city. The suburbs of Christchurch are: Mairehau; Shirley; Richmond; Avonside; Linwood; Woolston; Opawa; Sydenham; Spreydon; Addington; Riccarton; Ilam; Bryndwr; Merivale; Papanui; St Albans; Burwood; Parklands; Waimairi Beach; Avondale; New Brighton; Bexley; Aranui; South Brighton; Southshore; Bromley; Redcliffs; Sumner; Ferrymead; Heathcote Valley; Huntsbury; Cashmere; Westmorland; Hoon Hay; Halswell; Oaklands; Wigram; Sockburn; Hornby; Islington; Yaldhurst; Russley; Avonhead; Harewood; Bishopdale; Casebrook; Redwood. Christchurch has a number of satellite towns: Belfast; Brooklands; Lyttelton; Tai Tapu; Lincoln; Prebbleton; Templeton; Rolleston. Darfield is a town in the South Island of New Zealand located 45 kilometres west from the outskirts of Christchurch on The Great Alpine Highway. Darfield is the main town between Christchurch and the West Coast, New Zealand. It is often called "The township under the Nor'west arch", in reference to a characteristic weather phenomenon, which often displays an arch of cloud above an otherwise clear sky to the west of the township. This is caused by the condensation of water particles channeled upwards over the Southern Alps. Darfield lies in the Malvern district's arable and pastoral farming area. 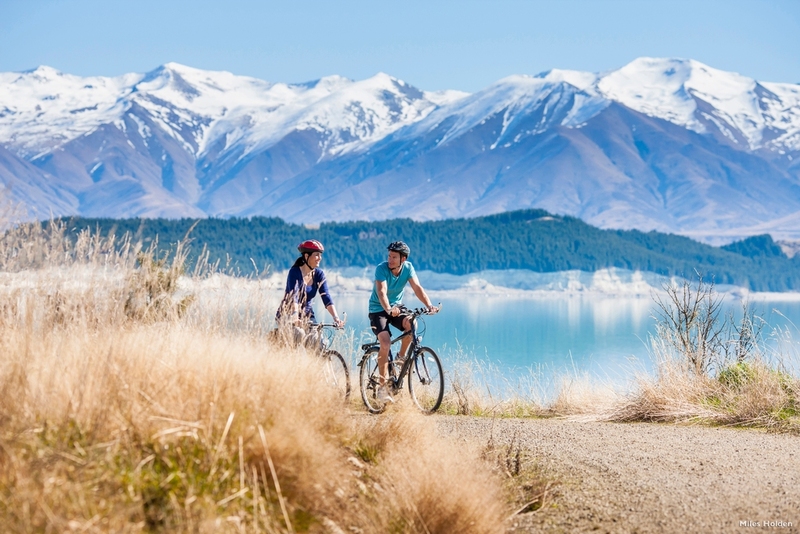 It is a gateway to the scenic Waimakariri and Rakaia Rivers and the Southern Alps, and is also a popular lift-off place for hot-air ballooning. Fairlie is a town in the Canterbury region of the South Island of New Zealand and commonly known as the gateway to the Mackenzie Basin. It was first known as Fairlie's Creek and supposedly named because it reminded early settlers of Fairlie in Scotland. Geraldine is a town in the Canterbury region on the South Island of New Zealand located about 140 kilometres south of Christchurch, and inland from Timaru, 35 kilometres to the south. Hanmer Springs is a town in the Canterbury region of the South Island of New Zealand. It is located inland, 65 kilometres southwest from Kaikoura, on a minor road 10 kilometres north off the northern route betweeen Christchurch and the West Coast via Lewis Pass. It is named after the hot springs in the area. There are two skifields, Hanmer Springs Skifield and Mount Lyford. Kaiapoi is a town in the Canterbury region of the South Island of New Zealand, located close to the mouth of the Waimakariri River and approximately 15 kilometres north of Christchurch. Kaikoura is a town on the east coast of the South Island of New Zealand located 180 km north of Christchurch. The Kaikoura Peninsula extends into the sea south of the town, and the resulting upwelling currents bring an abundance of marine life from the depths of the nearby Hikurangi Trench. The town owes its origin to this effect, since it developed as a centre for the whaling industry. The name 'Kaikoura' means 'The cooking place of crayfish', and the crayfish industry is a major contributor to the economy of the region. 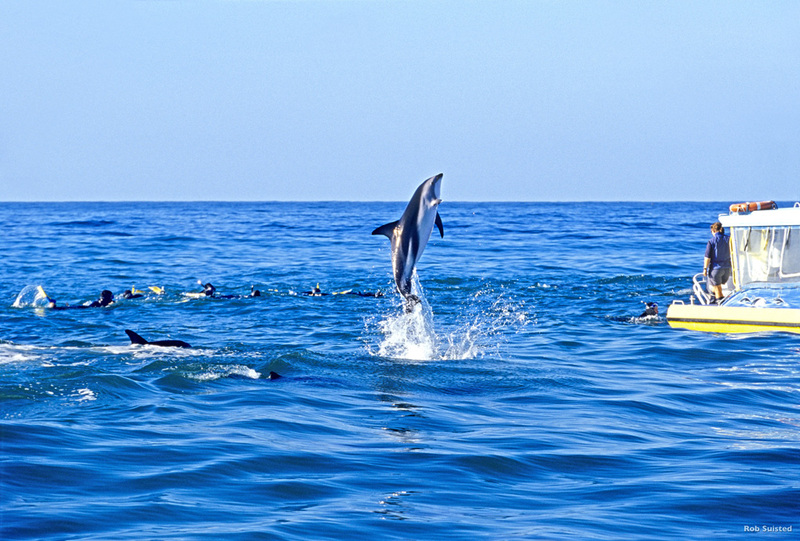 However Kaikoura has now become a popular tourist destination, mainly for whale watching (the Sperm Whale watching is perhaps the best and most developed in the world) and swimming with or near dolphins. There is also a large and readily observed colony of Southern Fur Seals at the edge of the town. It is also one of the best reasonably accessible places in the world to see open ocean seabirds such as albatross. The town has a strikingly beautiful setting, as the Kaikoura mountains, a branch of the Southern Alps come nearly to the sea at this point on the coast. 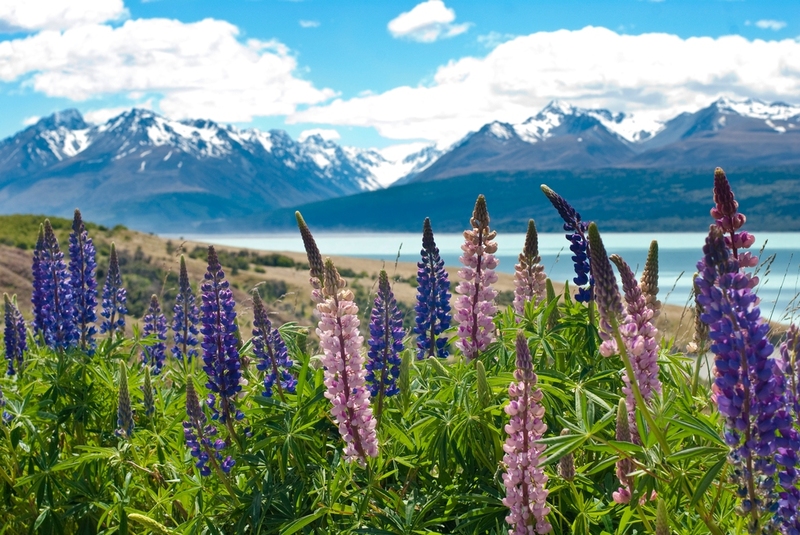 Spectacular Lake Tekapo is surrounded by golden tussock and snow-capped mountain landscape. The lake was originally a glacial valley and its stunning turquoise-blue colour originates from glacial sediment. There are two major glacier run-offs and six major rivers which run into the lake. Situated to the north of the Mackenzie Basin, the lake is 32 km long, 2000 feet above sea level, and 120 metres deep at its deepest part. There is one island in the middle. 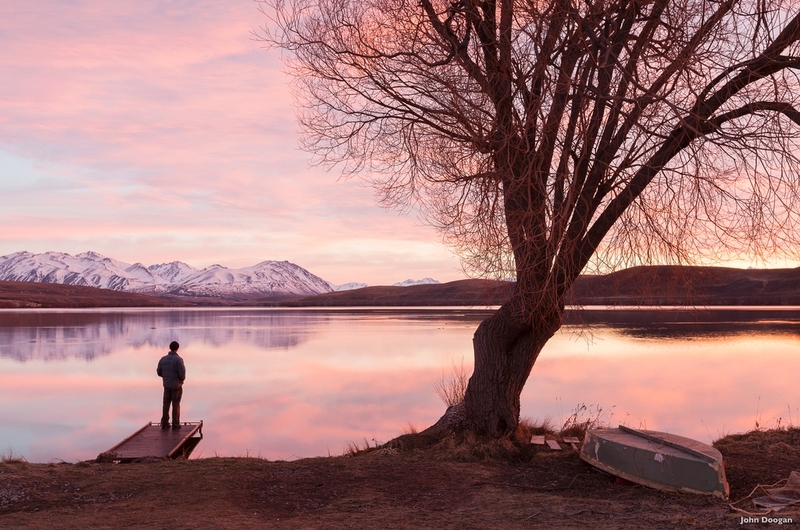 Lake Tekapo is located in the heart of New Zealand's South Island. 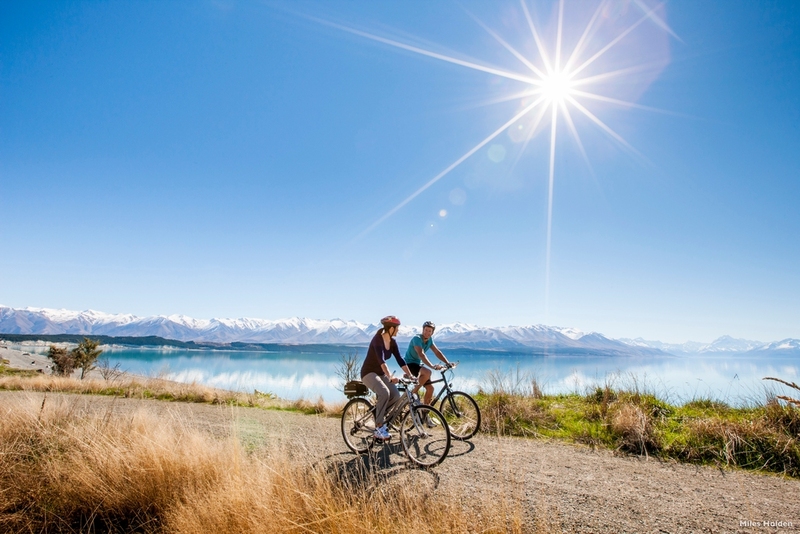 It is approximately halfway between Christchurch and Queenstown, and is close to New Zealand's highest peak Mt Cook. Leeston is a small town on the Canterbury Plains in the South Island of New Zealand. It is located 30 kilometres southwest of Christchurch, between the shore of Lake Ellesmere and the mouth of the Rakaia River. The town is a farming service centre. Lincoln is a town in the Canterbury region of the South Island of New Zealand. It is located on the Canterbury Plains to the west of Banks Peninsula, 22 kilometres south of Christchurch. It is the site of Lincoln University. Lyttelton is a port town located on the north shore of Lyttelton Harbour on Banks Peninsula, 12 kilometres by road from Christchurch on the eastern coast of the South Island of New Zealand. Rapaki and Corsair Bay are popular beach spots. The town is linked to Christchurch by railway and road tunnels through the Port Hills. At 1900 metres length, the Lyttelton Road Tunnel is the country's longest road tunnel. The harbour is an inlet on the north-western side of Banks Peninsula, extending 18 kilometres inland from the southern end of Pegasus Bay. It is surrounded by steep hills, formed from the sides of an extinct volcanic crater, that rise to a height of 500 metres. Several smaller settlements are dotted along the shore of the harbour, notably Governor's Bay and Diamond Harbour. A small island, Quail Island sits in the upper harbour to the southwest of Lyttelton. Methven is a town in the Canterbury region of the South Island of New Zealand. It is located near the western edge of the Canterbury Plains 35 kilometres north of Ashburton. It is a rural service town and also offers accommodation in the winter for skiers from the nearby Mount Hutt skifield. The magnificent Southern Alps stretch from Nelson in the north down to Fiordland in the south. 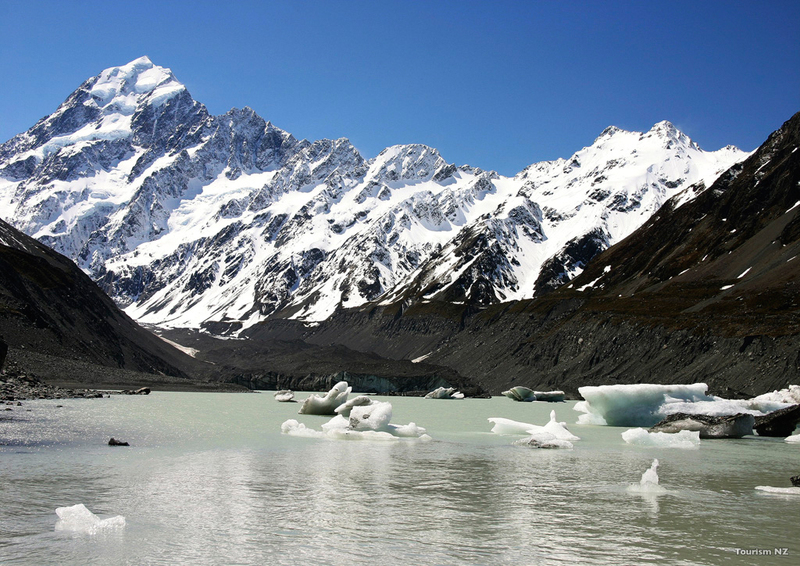 In this maze of mountains, Mount Cook stands highest, situated in the Mount Cook National Park. Awarded 'World Heritage' status in recognition of its qualities and rare beauty, the Park covers an area of nearly 7,000 hectares of majestic alpine scenery with more than one third being in permanent snow and glacial ice. The park contains 22 of the 27 peaks over 10,000 feet (3,000 metres) in New Zealand and provides a wonderland for walkers, skiers and mountaineers. A popular way to experience the grandeur of this mountain area is with a helicopter or a fixed wing flightseeing trip. When the Polynesians arrived fresh from the tropical Pacific they risked frostbite and lethal mountain rivers to gaze upon the mountain in awe, naming it Aoraki. Mount Cook was first conquered on Christmas Day in 1894 by Tom Fyfe, George Graham and Jack Clarke, all New Zealanders. 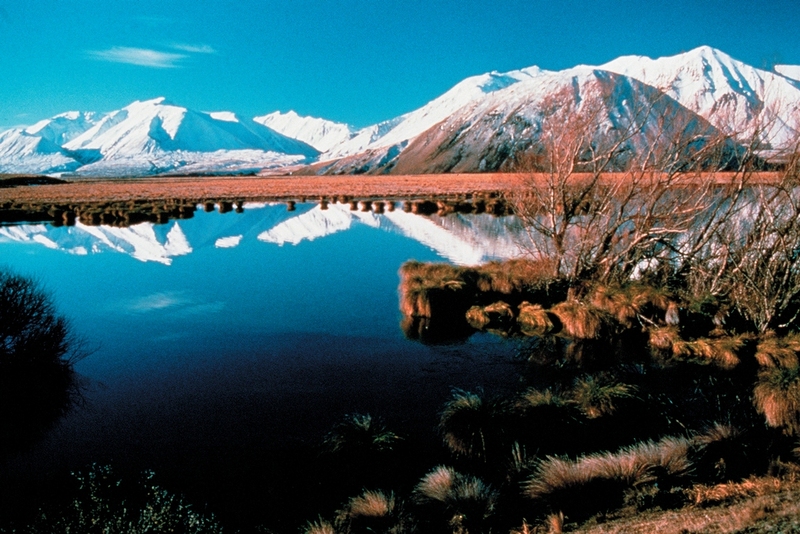 The Mount Cook Information Centre provides a fascinating array of historical and contemporary facts about the region. A special feature of this area is the mountain buttercup or Mount Cook Lily with its multitude of white blossoms that grace the land through spring and summer. The Park is also home to the mountain parrot, the kea, and also the yellow-breasted tomtit, tiny rifleman and the native pigeon. Oxford is a small town serving the farming community of north Canterbury, New Zealand. It is located at the inland edge of the Canterbury Plains, 40 kilometres northwest from Christchurch. Rangiora is the largest town in north Canterbury of the South Island of New Zealand located 25 kilometers to the north of Christchurch, close to the start of the inland Canterbury route, which skirts the inner edge of the Canterbury Plains, running southwest to Timaru via Oxford and Geraldine. Temuka is a town on New Zealand's Canterbury Plains, 15 kilometres north of Timaru. It is located at the centre of a rich sheep and dairy farming region, for which it is a service town. Timaru in south Canterbury, New Zealand, is located 160 kilometres south of Christchurch and 200 kilometres north of Dunedin on the Pacific coast. Caroline Bay is a popular beach area located north of the substantial port facilities. The northern industrial suburb of Washdyke is located at the junction of the main routh into the Mackenzie Basin. Twizel is a town in the Mackenzie Basin of the South Island of New Zealand. Twizel was built in 1968 to service the Upper Waitaki hydroelectricity scheme and was intended to be removed once the project had been completed, however its residents successfully fought to save the town. Twizel is a service and tourist town for visitors to the area. Nearby Lake Ruataniwha supports rowing, sailing and water skiing.